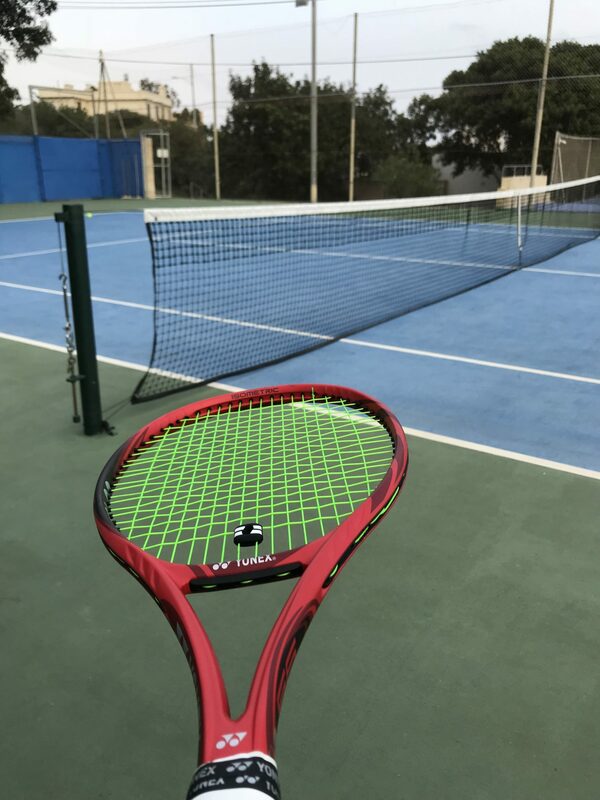 I have played my first couple of hours with the Yonex VCORE 95 and wanted to write a Yonex VCORE 95 Racquet Review – First impressions post. The update to the VCORE SV 95 is a positive experience so far. There are not many 95 sq inch racquets being released these days. 97 sq inch racquets have become the new norm for control frames, 98 is the new in-betweener, and 100 sq inch remains more of a power frame although I am sure in five years that might be the norm as a control racquet. Just look at what they did with the HEAD Graphene 360 Speed Pro (read my review). Since I am a fan of 95 sq inch racquets, I really looked forward to this VCORE 95 racquet review. And it did not disappoint. The Yonex VCORE 95 is pretty much a smaller and softer VCORE 98 (read my VCORE 98 racquet review here). The VCORE 98 did a decent job at everything but did not really wow me and at times I felt it lacked control. The feel was however relatively comfortable and it did provide good spin, so that made me curious about its smaller brother. I applaud Yonex for sticking with the 16×20 string pattern in this one as the string bed feels more controlled than the VCORE 98. I found the 310 gram stock weight a bit light for a 95 sq inch racquet and it made the racquet unstable at times. This is hopefully remedied with some lead tape in the hoop, but I am still wondering why they don’t release it as a 320-gram racquet straight away. Only advanced players will be looking at a 95 sq inch racquet and in 95% of the cases, they will add lead tape. 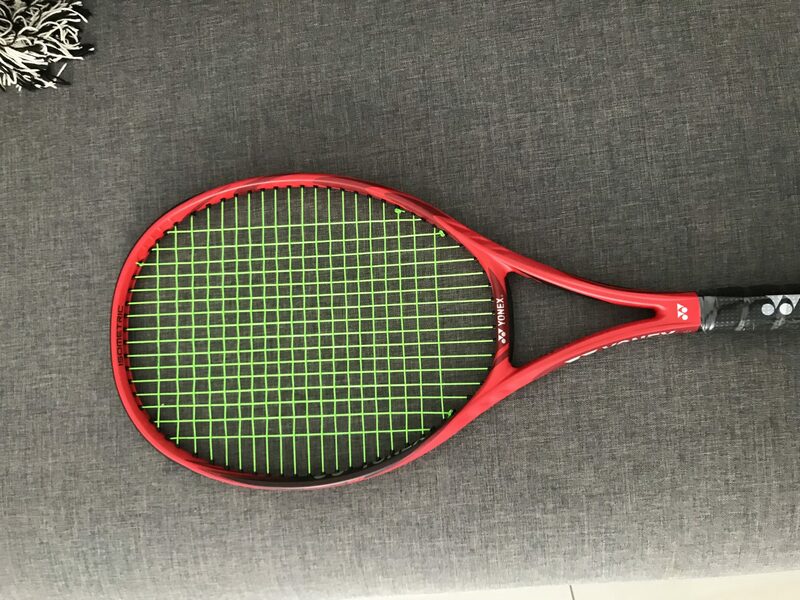 So a 320 gram unstrung weight like the good old Yonex VCORE 95D that Stan Wawrinka uses under various paint jobs would be the way to go in my opinion. I guess they wanted to make a racquet that swings really fast, Denis Shapovalov-fast, however, you still need more mass to counter shots from players that hit big. I hope a couple of grams at 3 and 9 will improve the stability enough. LIke I wrote above, the response of the string bed is nice and plush and I think they did a good job in lowering the RA from 65 strung of the SV version to the 62 RA strung of this fire-red version. I just want to point out that this is no “wet noodle”. I strung it up with Solinco Hyper-G 1.25 at 22 kg and felt that it complemented the frame nicely. The Yonex VCORE 95 does most things well. 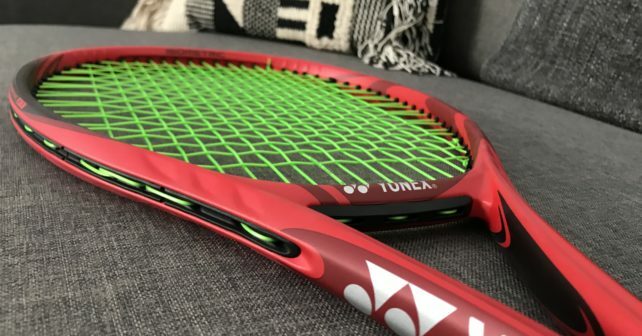 I liked the touch on volleys, the sweet spot feels bigger than on most 95 sq inch racquets and the 16×20 string pattern provides good spin but not an erratic launch angle which I sometimes found on the VCORE 98. The design is spot on, the racquet moves quickly through the air and for some reason I really felt at home with it on my one-handed backhand. It is like Yonex knows exactly what one-handed backhand players need (just ask Denis and Stan). I did like the Yonex VCORE 95 better on more spin-oriented shots than when you hit flat. On flatter shots it felt a bit inconsistent, but I think that might be due to the lack of plow-through. When I added some extra spin on my shots, I felt I got really nice power and spin from the frame and it was quite addictive to hit with it. I hope I can give you more information when I have played it with some lead tape in the hoop. That is definitely required for this frame to shine, but I can already say that this is a nice platform stick ready for customization. If you want a stable frame around 330 grams, I would look at a bigger head size, because this one definitely needs a 340+ gram spec to play well. Is that Hyper G you’re using? can you recommend some raquets that play fairly similiar to the iprestige mid or mp. I have been playing the mid for a while but it is really hard to find more of these frames since they are old and not sold in stores anymore. maybe you know where i can get more of those racquets, otherwise i would really appreciate some recommendations. Great review. I like the fact that the racquet comes lighter in stock since it is always better to add weight as you test. I really hope that manufacturers lower the ra. I think prince is going to release a 58ra by next year. That would be awesome. Just hope they dont do it in january simce i have recently purchased 3 pt57a from a very reliable and friendly source. Hint hint. Cheers amd keep up the great reviews! I have also enjoyed this racket, these 95 frames with low RA are very rare. I put 1g of lead to 3/9 clock positions and 4g to handle to maintain the balance, which gave better plowthrough. Now I have reduced the tension from 23kg to 22kg with Hyper G 1.25, will be interesting to the effects and see how you modify the racket. I really wanted to love this stick, even bought one, could not wait for a demo. It saddened me that on my first few strikes I knew with was not going to work out. I’ve had the 95D, SV97 and currently play with the buttery Tour G 310 with lead and the 330. Even have a couple Duel G 310s. Also owned and sold the Vcore Pro 310 and 330, those were a real disappointment, much more nimble, but too unstable. I don’t know what exactly it was about the Vcore 95, it just felt a big dead and the flex was off. Also the aero hoop shape made it feel like there was a dull thud, but not in a good way, it felt like a big piece of copper. I really had no feel with this stick. I sold it the next day. Sometimes you just know a stick is not going to work out. I have yet to find a stick more comfy and with the right flex as the Tour G 310. It’s low powered, but with the 97 it has pop at the right time. And the feel is out of this world. Can work slices, go inside out with the OHBH, it’s just not that great on forehand. Serves are good, second serves are even better. I think usually you need a bit more time with a racquet to understand how it plays, really recommend to give it a week or three before you decide. But I can understand what made you shy away from it if you did not like the VCORE Pros – I thought the feel was quite similar. I am definitely going to try the Tour G 310 now. A buddy of mine (who is a better player than me) plays with them and thinks they’re great. I would check out the new Srixon Dunlop CX 200 Tour 18×20. Has a nice crisp but comfortable feel, reminiscent of the iPrestige MP. If you want a smaller head size you should go for the Prince Phantom 93P. Two great sticks!